Die englische Ausgabe basiert auf der 2. Auflage der "Zauneidechse" von Ina Blanke aus dem Jahr 2010 und präsentiert den aktualisierten Forschungsstand zur Biologie der Art, z. B. zu Kletterfähigkeit, Kälteresistenz und Ernährung sowie aktualisierte Daten zu Verbreitung und Systematik. Für den Artenschutz und die Planungspraxis besonders bedeutsam sind neue Erkenntnisse zur Raumnutzung und Praxisbeispiele zur Vermeidung und Minimierung von Eingriffen. Ungeahnte Fangerfolge durch die Kombination alter und neuer Fangmethoden bei Umsiedlungen werfen auch ein neues Licht auf die Aktivität der Tiere und die Schätzung von Populationsgrößen. Auch auf neue Gefährdungsursachen wird eingegangen. Noch mehr als die letzte deutsche Ausgabe von 2010 richtet sich diese Ausgabe auch an Nicht-Biologen, was sich in zahlreichen vertiefenden Erklärungen widerspiegelt. 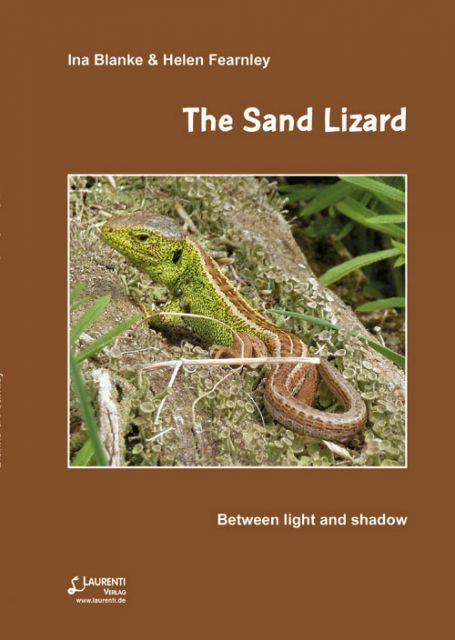 The lives of sand lizards are characterised by light and shadow. Sand lizards are particular and selective creatures; living close to one another and favouring structurally diverse areas of vegetation scattered with patches of open ground in which to lay their eggs. This is their ideal habitat, their home; where their white and dark markings cleverly disguise their delicate body contours against dappled vegetation shadows that provide the perfect camouflage. The sand lizard is a strictly protected species, as listed in the Habitats Directive of the European Union. In countries such as Great Britain where the species is at the geographic limits of its large range, the lizards are endangered and confined to locations that contain their ideal habitat. In the central areas of their Eurasian range, sand lizards are widespread and found in a variety of habitats across many different landscapes. There are marked differences within and between populations in social behaviour, activity patterns and use of space. These differences appear to the researcher, to be as varied as the dorsal markings of sand lizard themselves. This book is a consolidation of sand lizard literature which presents our current knowledge and understanding of the species. It is aimed at the enthusiast, those working in the ecological sector and in site management. The chapters are wide-ranging and review the general appearance, systematics and distribution of the sand lizard across its entire range then examine their diet, behaviour, threats, habitat and population ecology. The reader is taken on a seasonal journey from the emergence of the first lizard in spring to the retreat of juveniles into hibernation. This book also contains valuable practical conservation advice and provides examples of best practice when working to ensure the longevity of our sand lizard populations at a time when development pressure is fierce.